(Nanowerk News) Professors Myung-Ki Kim and Yong-Hee Lee of the Physics Department at KAIST and their research teams developed a 3D gap-plasmon antenna which can focus light into a few nanometers wide space. Their research findings were published in Nano Letters ("Squeezing Photons into a Point-Like Space"). Focusing light into a point-like space is an active research field as it finds many applications. However, concentrating light into a smaller space than its wavelength is often hindered by diffraction. 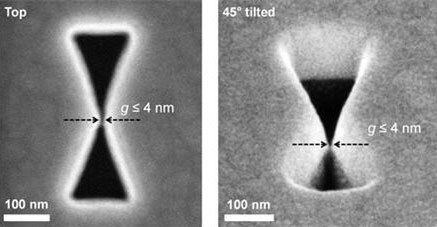 In order to tackle this problem, many researchers have utilized the plasmonic phenomenon in a metal where light can be confined to a greater extent by overcoming the diffraction limit. Many researchers focused on developing a two dimensional plasmonic antenna and were able to focus light under 5 nanometers. However, this two dimensional antenna reveals a challenge that the light disperses to the opposite end regardless of how small it was focused. For a solution, a three dimensional structure has to be employed in order to maximize the light intensity. Adopting the proximal focused-ion-beam milling technology, the KAIST research team developed a three dimensional 4 nanometer wide gap-plasmon antenna. By squeezing the photons into a three dimensional nano space of 4 x 10 x 10 nm3 size, the researchers were able to increase the intensity of light 400,000 times stronger than that of the incident light. Capitalizing on the enhanced intensity of light within the antenna, they intensified the second-harmonic signal and verified that the light was focused in the nano gap by scanning cathodoluminescence images. This technology is expected to improve the speed of data transfer and processing up to the level of terahertz (one trillion times per second) and to enlarge the storage volume per unit area on hard disks by 100 times. In addition, high definition images of sub-molecule size can be taken with actual light, instead of using an electron microscope, while it can improve the semiconductor process to a smaller size of few nanometers.